This guide explains how to create a price and a promo code with DaCast’s new paywall. Read the whole monetization walkthrough. 3. How to set a price for my video content? Make sure the paywall is enabled. If the toggle-switch is turned OFF, no paywall will display. Otherwise, the paywall is enabled per default. Step 1: Select the video content for which you want to add a price. Price: Create a price. To create several prices, click on “add more price options,” and then define the currency for each price. Note: you must individually define the price for each currency. This website can guide you through the conversions. [If Pay Per View] Duration: Set up the access duration of your content (hours/days/weeks/months). [If Pay Per View] Start method: Decide to schedule or not your Pay Per View. [If Subscription] Recurrence: Set up the recurrence of the subscription weekly/monthly/quarterly/biannually. NOTE ON THE PRESET: A preset allows you to re-use a Pay Per View/ Subscription already created in the past. If you decide to SAVE AS A PRESET, you will be able to re-use that setting in the future. 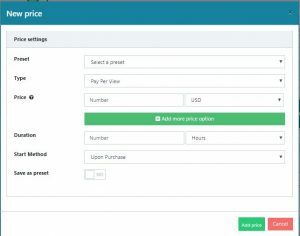 Simply select it from the drop-down menu that appears in the first field (“Preset”) when creating a new price. When you select a preset via the drop-down menu, it automatically fills each field of the pop-up window. Find your saved presets in the new MONETIZATION section > DASHBOARD > PRESETS tab. Step 1: Select the content you want to monetize. Step 3: Create a price or reuse a preset. Step 4: Save your settings. 4. How to apply a promo code to my price? Step 1: Click on the video content for which you want to add a price. Alpha numeric code: Set up the name of a discount promo code (min 5 characters). You cannot reuse the same Alpha-numeric code once created unless you delete it. Percentage discount: Set up any percentage discount (100% for a free pass). Rate type: Set your Promo code as either a Pay Per View or a Subscription, according to the price type created. Limit: Set a maximum access number. For unlimited access, simply leave the box blank. Date start/end date: Schedule your promo code. Select when your promo code takes effect, and when it expires. If you want a promo code to remain available indefinitely, do not fill in the end date. A start date is required. [If Subscription promo code] Discount applies: Make the discount valid once, or with each subscription renewal. NOTE ON THE PRESET: Just as with the preset option for a new price, a preset allows you to re-use an existing promo code created in the past. 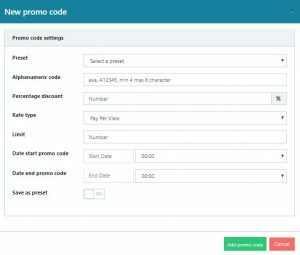 If you decide to SAVE your promo code AS A PRESET, you will be able to re-use it in the future. Simply select it from the drop-down menu that appears in the first field “Preset” when creating a new price. When you select a preset in the drop-down menu, it automatically fills each fields of the pop up window.Find your saved presets in the new MONETIZATION section > DASHBOARD > PRESETS tab.